Our Study Group monthly meeting took place at ABK Hall as scheduled. With Chennai seeing unpredcedented rain, attendance was thin. 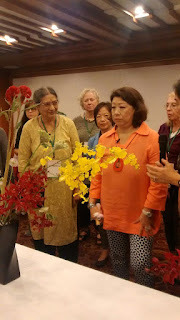 Eight members were present to listen to the recap of our study Group members who went to Taipei, Taiwan, to attend the Regional Ikebana convention. There were 400 registrants, besides Asians there were members from African Region, Australia- New Zealand region, European and North American Regions too. India and SriLanka were represented in good numbers. Our members who attended were Senseis Malathi and Meenakshi, and student Divya. 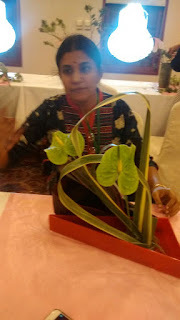 Divya's daughter Pratibha accompanied her as a guest, and we hope this will bring her in to the Ikebana fold! Many of the pictures in this post are courtesy Pratibha. "I particularly, appreciated the Taiwanese Cultural shows. 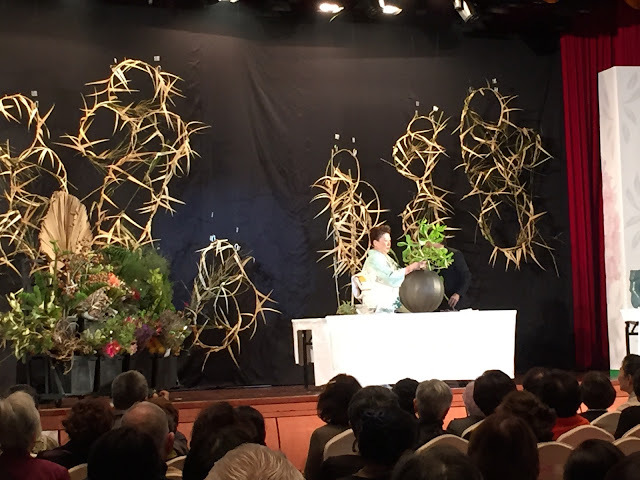 The President of II set out the theme for this Conference as "Mind, Body, Spirit" and through the motto of 'Friendship Through Flowers' she spoke of how we should wish for Peace and Happiness in the world, especially citing the Flower Power that could make wonders in the world. 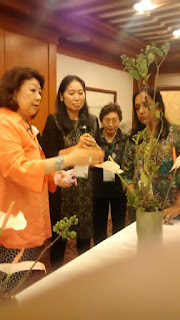 The Chief Guest and Demonstrator was Iemoto Ms. Akane Teshighara of the Sogetsu School of Ikebana. 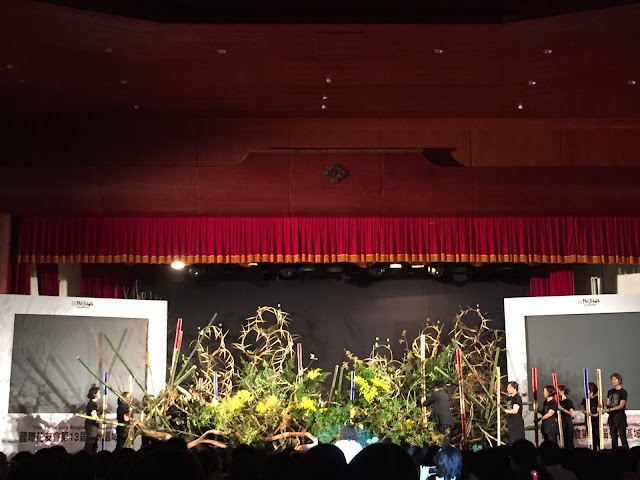 There were demonstrations by Director, Taiwan Ikenobo Branch, Director and Founder Chinese Floral Art Foundation, Director, Singapore Sogetsu Branch, First Master Ohara School, Hyderabad and President of Okinawa Kozan-ryu. All the demonstrations were delightful to watch. Workshops. There were two workshops conducted by Iemoto Akane. The Indian members were in the second workshop. She gave two demonstrations in the workshop, one with all leaves and the other focusing on Colour and Line. Participants were divided into four tables. Each table had the same shape of container and the same kind of materials. We were instructed to render a Free Style composition. After about half an hour or so Iemoto came around to give her comments. Each one she examined in detail and gave valuable comments. Her patience and interest in members' work was remarkable. While summarising she pointed, how with the same container and materials each one of us brought out our individual personality and interpretations, and that was the unique characteristic of this Art. It was very rewarding and fullfilling experience. Pratibha Selvam was such a great help with photography. Each and every arrangement was taken so carefully. Thank you so much, Pratibha. The Demonstration. The final Event was the demonstation by Ms. Akane Teshighara. It was for two hours. Initially, she composed medium sized ones. Before a short intermission, she requested two volunteers from the audience, one to choose a container and the other to choose the materials, with which she brought out a lovely composition. And finally it was a large mural-like composition, which filled the whole stage. In this what we have to observe is the stage-by-stage planning and execution, especially when the whole audience is patiently waiting in total silence for the finale.After completion, different hues of light on this composition made us gasp with wonder! On the whole it was a very memorable event." The trip to Taiwan was a step going back into fairyland. The venue The Grand Hotel was a trip perfectly suited for the event. 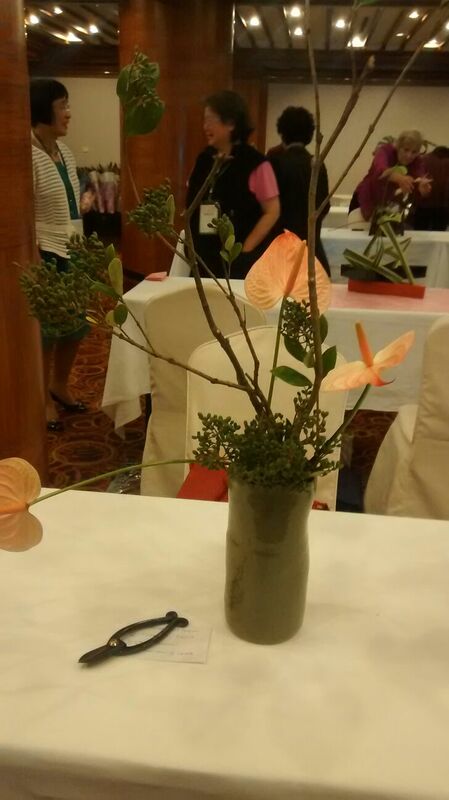 The easy friendship with the sole purpose of Ikebana is amazing to see. Ideas flowing effortlessly and the use of simple materials floors one. Remarks and corrections from the Iemoto. The exhibition put up by everyone left me astounded. The highlight of the event was the workshop with Iemoto Akane where she was able to give 70 different type of corrections for all the works! 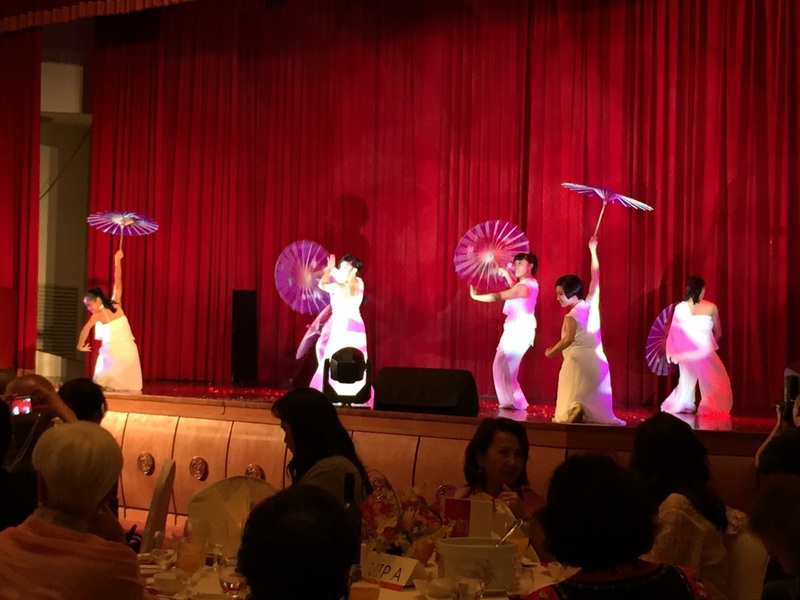 The welcome and the Sayonara Dinner were beautifully put together leaving lingering memories of five eventful days. "I am so glad that I could visit the Taipei conference with my sensei. The venue for the event, The Grand Palace Hotel was so well suited for the same. The exhibition. The various displays by members at the event was so spectacular and unique that it opened my mind to so many possibilities in Ikebana.The array of flowers and leaves kindled my perspective on how beautifully they can be used. Divya, with her arrangement at the workshop. was yet another event I was so fortunate to attend. The sightseeing trips of the natural wonders around Taipei City will also stay in my memory for long. Thank you for a wonderful time!"